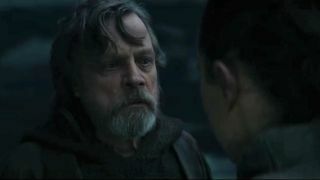 After watching the first teaser for a Star Wars: The Last Jedi deleted scene, you might be wondering why it didn’t make the cut. It’s got all the ingredients of an iconic sequence: a Jedi training montage, spectacular visuals – and even Rey showing her mentor, Luke Skywalker, who’s the boss. The brief clip, which you can take a gander at above in The Star Wars Show’s latest video (skip to 3:56 for the goodies) sees a quick sizzle reel of Rey action. She’s cutting through some bamboo-style thickets with her lightsaber (very cool), running across the harsh terrain of Ahch-To with what looks like The Caretakers’ community lit up in the distance (even cooler) and, oops, my Cool-o-meter has broken because, yep, there’s Rey giving Luke a big ol’ dressing down. “That old legend of Luke Skywalker that you hate so much – I believed in it”, admonishes Rey through gritted teeth. Luke doesn’t respond, but his glassy, tear-filled eyes tell the whole story. I really wish this had ended up in the final version. Not only does it give more depth to Ahch-To’s Caretakers, it really fleshes out Rey’s relationship with her reluctant teacher. In fact, Rey never really showed that much passion and anger in the actual movie, let alone have an honest-to-goodness argument with the Jedi Master. Rey is simply more believable here.